The Kingspan KoolDuct® System of pre-insulated ductwork is like no other insulated ductwork system. It is the most advanced and innovative system of air-distribution ductwork available worldwide. 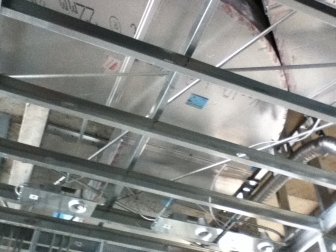 Ductwork is fabricated using rigid insulation panels in sections up to 4 m / 13’ and can provide the optimum energy saving and environmental solution in comparison with other types of ductwork. The Kingspan KoolDuct® System comprises premium performance Kingspan KoolDuct® panels, fabrication methods, jointing systems and a complete line of accessories to produce a System where air leakage can be reduced to a fraction of that typical of sheet metal ductwork. The components and techniques that are associated with the fabrication of ductwork from the System have been established in the European marketplace since the mid-1960s. The Kingspan KoolDuct® System is the clear leader in new generation pre-insulated ductwork.